This 528 Orgone Generator is a therapeutic energy device with many uses. It can clear chakras and energy blockages in a matter of minutes. It is a bio-energic pain reliever, so if you have aches or pains, put the Crystal Harmonizer on the area, base down against the skin. After 10-20 minutes the pain will subside or be gone. It is best used with prayer for enhanced effect! You have heard about the good vibration of 528Hz for transmitting LOVE, the Universal Healer. You may also know about ORGONE generators used to transmit subtle healing energy with noticeable benefits. Put these technologies together and you have some of the best natural healing instruments in the world. 528 Bio-Energy Technology . . . In the photos, you can see the main components of our 528 Orgone Generator base used to transmit 528 hertz bio-energy to you, your environment, or your bath water. 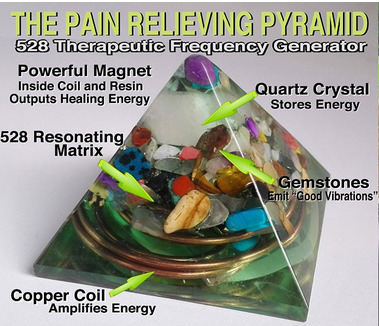 It includes: Copper Coils; Powerful magnet (south pole bottom, north pole up); Quarts crystal and natural gemstones for generating natural energies; Pure quality high cost natural resin matrix (not fiberglass) cured with light and sound to resonate the 528Hz/528nm frequencies for optimal healing; The magnet in the 528 Orgone Generator pyramid is positioned North facing down so that when you place these orgone generators down upon painful locations on your body, you send alkalizing electrons into the tissues on this side. The large 528 Orgone Generator Pyramids are used for filling your entire room or office with this healing vibration and positive energy of LOVE! The Standard pyramids are good for physical therapy. Place them on spots that needs extra healing energy, and watch pain disappear quickly, most miraculously. These small pyramids are great for small places, like your car, to broadcast the good vibration of 528. You can affix these units to your dash board for added protection and stress reduction. The small Auto Energiser pyramids are good for immediate pain relief in the car and energizing the environment with powerful, positive, relaxing love energy The 528 vibration is, after all, the MIracle frequency of the original Solfeggio musical scale. These devices have an elaborate coil of copper wire strung throughout the crystal structure with different gemstones for each of the chakras/energy centers of the body. This coil is suspended in a matrix of copper, titanium, and resin. At the base, is a north facing neodymium magnet. This simple arrangement receives, amplifies, and directs the orgo-Chi-life force or natural healing energy. These are wonderful tools for personal use or for use in your energy-medicine practice. •Colorful “Perfect Circle of Sound™” amulet window sticker. 1. A number of design features enhance the energy generating power of these bio-energy-accessories. and physically-sustaining frequency in nature. 4. Sends negatively-charged electro-magnetics into the environment to neutralize positively-charged dust and germs to help oxygenate and energize the home. 5. Enhances your home with “Therapeutic Art” that makes you feel good. 6. Pushes body acid out of painful muscles and joints to relieve aches and pains without drugs and harmful side effects. I've been studying resonance and frequency lately and the power of sound, magnets and crystals so when I saw this I had to try it. I'm a quadriplegic in a wheelchair or with several ailments and my right big toe has been giving me pain for about five years. Wasn't expecting pretty much anything but I put it on there and it reduced the pain by more than 50%! Definitely recommend it for anyone suffering with undiagnosed pain the doctors don't have an answer for or any pain for that matter. To God be the glory for all healing! Click the button below to add the 528 Orgone Generator Pyramid (2") (Auto Energizer) to your wish list.